I graduated from a premier institute located in one of the loveliest cities of India; Bengaluru; way back in Nineteen Sixties. I can still remember the city of those days with its wide and specious roads, gardens and salubrious weather and the coffee houses. People used to say jokingly that Bengaluru has a natural air conditioning, it never gets hot here. With the passage of time, first came the industrialization and then the Information technology revolution starting with Y2K. Bengaluru remained on the forefront and grabbed a major share of this sunrise industry. With the industry booming to unprecedented levels, came the riches and the affluence. The city started getting overcrowded. New high rise apartments came in to cater to the new rich. Unfortunately, all this was at a cost. 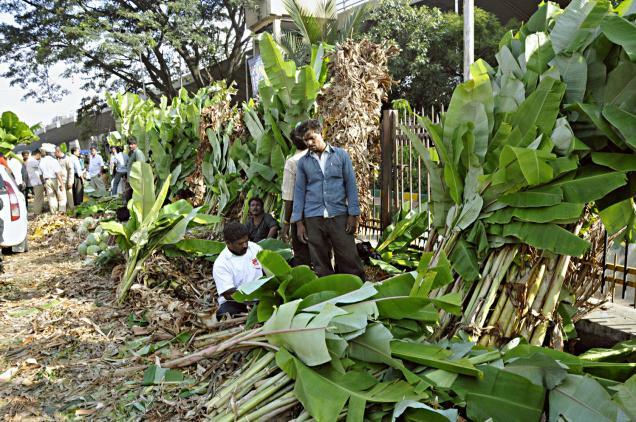 The beautiful salubrious weather of Bengaluru was the first victim. Gone were the days of natural air conditioning. As the city grew, weather changed for the worst. With the overcrowding, another menace raised its head for the first time around month of August in this year (2012). Traditionally, Bengaluru municipal corporation, used to collect the garbage generated in the city and then use landfills in nearby places like Mavllipura, Cheemasandra, Anjanapura, Mandur and Terra Firma in Gundalahalli, (Doddaballapur Taluk.) to dump it. 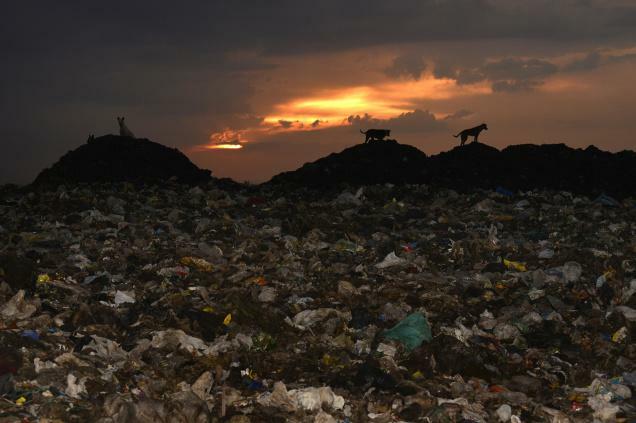 With a quantum of about 5000 tons of garbage pouring in every day from Bengaluru to outskirt villages, the villagers from the 15 affected villages near Mavavllipura raised an alarm and submitted a memorandum with 11 demands to the Mayor of Bengaluru. The demands included revoking permission granted to Ramky to establish a waste to energy plant at Mavallipura, shift the 4.0 Million tonnes dumped in Mavallipura, 1.6 Million tonnes on land belonging to the Forest Department and 2.0 Million tonnes dumped on Gomala land there. Responding to this petition, Karnataka State Pollution Control Board (KSPCB) ordered the closure of the Mavallipura landfill. Incidentally, at that time, Cheemasandra and Anjanapura landfills were already full. This naturally created tremendous pressure on other two landfills. 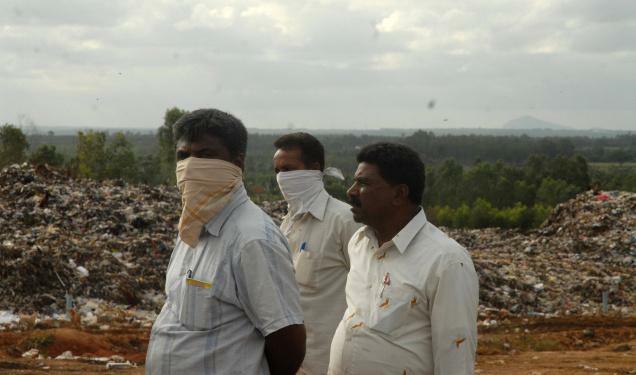 After 27 August 2012, residents near the Mandur landfill, commenced a blockade of all garbage trucks coming to the dump. In a chain reaction, communities near the Terra Firma landfill threatened to stop trucks from dumping waste after August 30. The garbage problem for Begaluru city had just began. On August 30th, Mayor of Bengaluru municipal corporation, confirmed that Mavallipura dumping has been stopped and attributed Bengaluru's garbage problem to the plastic waste, which according to him was not segregated. To find a solution to the garbage problem, Bengaluru municipal corporation came out with a scheme, where residents were asked to segregate the garbage. Then scheme was launched on 2nd October. 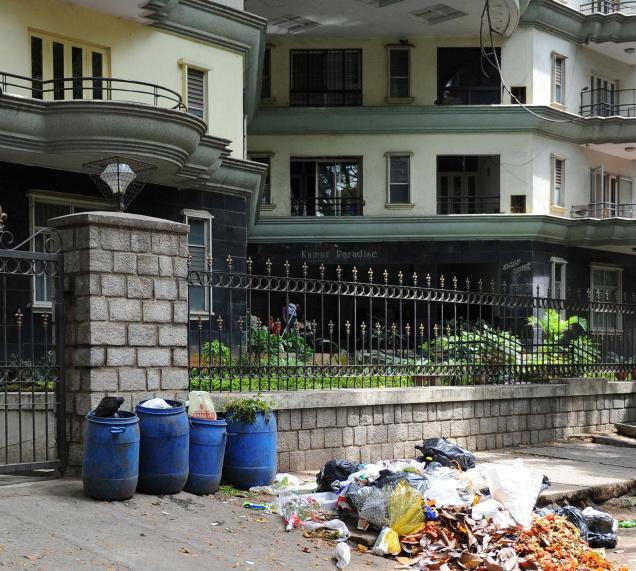 It is a sad observation that most of the Bangaloreans failed to rise to the occasion and only 15 per cent of the citizens segregated waste and gave away only wet waste. On day one of the new scheme, 2,766.8 tonnes of plastic mixed waste and only 514.69 tonnes of segregated waste were collected in the eight zones of the city. On October 13, Government decided to use three unused stone quarries to dump the waste as a temporary measure. By October 19, Municipal corporation reported that 6000 tons of garbage was rotting on city streets. On 20th October, Municipal commissioner admitted that the garbage on city streets is not moving at all as there is no place to take it. As a result, garbage started to be dumped on outskirts of the city itself. Finally, on October 23rd, Mandur villagers agreed to accept the garbage for 3 months only and Bangoloreans won a very temporary respite. The municipal corporation started moving about 3000 tons of garbage every day and the city heaved a sigh of relief. With the accumulation of garbage, mosquito bred disease are on the rise. In Bangalore city limits alone, 868 dengue cases have been reported in this year. What a pathetic story this one is? What is the use of Bengaluru's rise and shine, if the city is unable to provide basic amenities to the citizens? Perhaps what happened in Bengaluru, could happen any where else, including my city. I do not know what future holds, but one thing is for sure. The garden city that I love, is long gone, submerged in heaps of garbage. There is garbage now in my garden, which I just can not get rid off. Want to read Akshardhool on your Mobile device? It is a joyous occasion for all Cambodians and art lovers from all over the world. Real life Zubeida was very beautiful and was born into a Muslim family connected with the films.. Copyright - Chandrashekhar Athavale. Simple theme. Powered by Blogger.